The Bombardiers will boast a relatively young group in 2019 but are still ready to compete in a difficult Hockomock League. With a total of 14 underclassmen – eight sophomores and six freshmen – there will certainly be learning curves and some ups and downs throughout the year, but those new faces are hungry to improve throughout the season. Attleboro’s strong suit will be in net as Hockomock League All-Star Trevor Koppy, a captain for this year’s team, returns to the cage. Koppy is one of the most experienced netminders in the league and the Bombardiers will be relying on him for his play plus his leadership as a captain. Attleboro will also rely on the leadership on and off the field by junior captain Tom Shipman, who will be a key piece in the midfield. Shipman will be joined by senior Zach Thomas and sophomores Michael Strachan and Aidan Diggin in the midfield. All four have plenty of varsity experience so Attleboro will certainly rely on them to guide the way as the younger players are incorporated into the lineup. Sophomore Matthew Perry returns up front while junior Jack Handy is back defensively. The Bombardiers are hoping junior Bryson Friess and freshman Fred Wheaton will make an impact defensively while freshmen Keigan Conley and Jack Lamothe will bolster the attack. Freshman Ryan Betts will also be apart of the midfield unit this season. After missing out on the playoffs in 2017, Canton put together a memorable 2018 campaign that ended in the D2 South Sectional Semifinals. The Bulldogs are looking to replicate that success and make another deep tournament run again this year. And with a good amount of players back from last year’s squad, there is a lot of optimism that tournament run can happen. Senior Griffin Roach, a HockomockSports.com Second Team selection, will pace the offense again this year. Roach had 30 goals and 17 assists last year and his competitiveness is contagious to those around him. Roach will be joined by classmate Dan Cohen, a Hockomock League honorable mention selection. Cohen is a dangerous player, scoring 24 goals in the regular season last year. David Allen, Chris Lavoie, Brendan Clifford, and Matt Martin are great athletes and capable scorers as well, while Tommy Vaughan will look to make an impact with his playmaking ability. On defense, the Bulldogs will turn to Brendan Albert and Nick Mackay, who head coach Bill Bendell called two of the most underrated players in the Hockomock League. Both possess a boatload of experience at the varsity level and will anchor the Bulldog defensive group. George Kent and James Murphy will also be apart of Canton’s defense while Shane Marshall, Sam Walsh, Jack Albert, and Carson Campbell will all see time and make key contributions this seasons, Bendell said. Sophomore Dylan Coyne will take over in net for the Bulldogs and has had a strong preseason so far. Bendell believes Coyne is poised for a breakout year. Jeff Fitzgerald, Tommy Ghostlaw, and Mackay will all be in the running to handle faceoff duties. Foxboro will have a young squad with just five seniors this year but that doesn’t mean there will be a lack of experience from the defending Davenport division champions. Senior Brendan Tully sets the example with his work ethic but is also one of the most dangerous players in the Hockomock League. 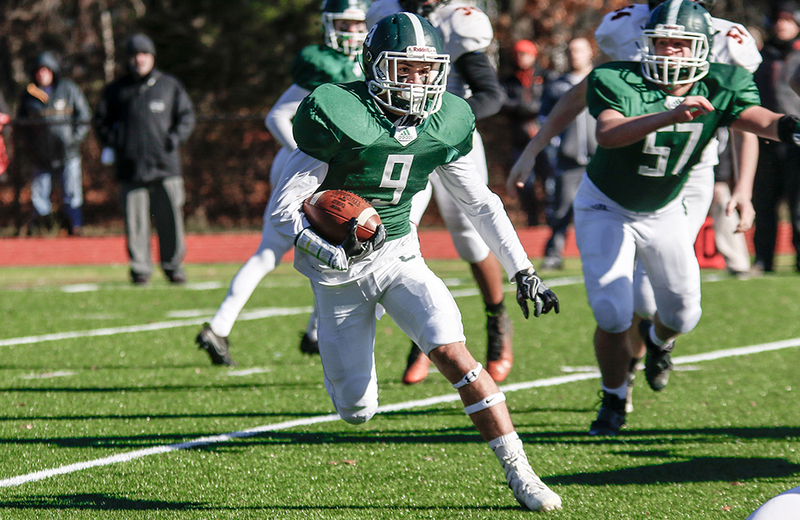 A Providence College commit, Tully has tormented defenses for the past two seasons. He had 44 goals and 22 assists last year and will be one of Foxboro’s main weapons. Tully will be joined by Bobby Yerardi, who had over 40 points as a sophomore and has improved his game in the offseason. His ability to finish right or left makes life difficult for opponents. The Warriors bring back junior Shayne Kerrigan for faceoffs. Kerrigan is one of the best in the area on the draw and puts Foxboro in good positions time after time; he will be a key piece in the midfield for the Warriors. Junior Pete Conley, Aiden Stapleton, and Charlie Baughan will make the up the attacking group for Foxboro this year. Pat Stapleton is one of the most experienced players in the league as well as one of the top defensive players. He will anchor a defensive unit that has been one of the best in the region over the past couple of seasons. He will be joined by juniors Ronnie MacLellan and Will Morrison. All three players have the ability to move up to LSM when needed. 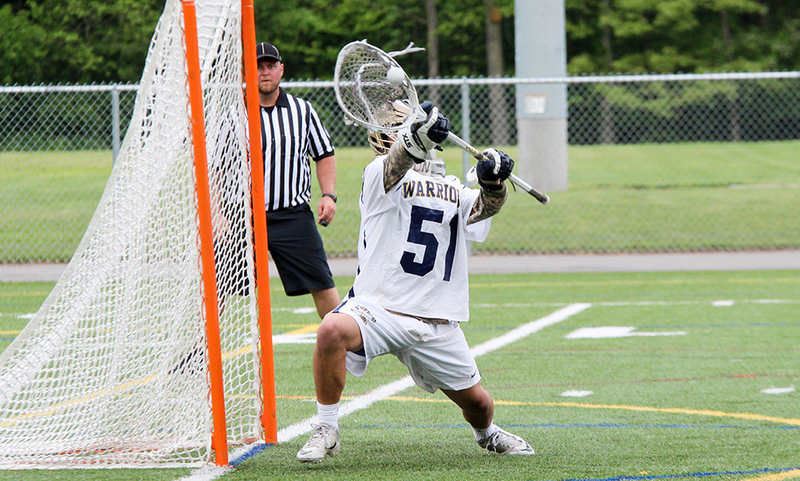 One question mark for the Warriors could be goalie, as Foxboro graduated Hockomock League MVP Jake Addeche. Head coach Matt Noone is confident in his options this season, with four players competing for the time in the cage. Freshman Matt Tully is beginning the season as the starter. Franklin has had a lot of success in recent years, and that trend looks like it will continue in 2019. The reason for the high expectations is the amount of talent returning from last year’s Kelley-Rex team that reached the D1 South Quarterfinals. Although the Panthers graduated two-time All-American and two-time HockomockSports.com Player of the Year Eric Civetti and starting goalie Connor O’Rourke, Franklin has experience and talent back at each position. It all will start with senior Jacob Alexander, who has been arguably the best faceoff man in the entire state over the past couple of seasons. Alexander’s ability to consistently win draws gives Franklin a huge advantage and sets the offense in motion. Patrick Morrison, a second-team All-American selection last season, will anchor the defensive unit for the Panthers this year along with Will Harvey, who was one of the most underrated players last year. Will Davis, who saw time in net some last year, is set to take over in the cage and could be one of the top netminders in the league. The Franklin midfield will consist of Nitin Chaudhury – one of the hardest working athletes in any sport – along with Owen Palmieri and Ben Kolb, who has really impressed in scrimmages during the preseason. Franklin’s attack could be among the most dangerous in the league this year with three legitimate options. Jake Davis (32 goals, 23 assists), Matt Lazzaro (30 points), and Ben Greco are all unselfish but can also finish. King Philip is hoping that a good amount of returning experience from last year’s team will result in a successful season and possibly a run through the D1 South bracket. The Warriors have one of the most experienced attackmen in the league in Colin DeVellis, who has been one of the best finishers in each of the last two years. He finished fourth overall in points his sophomore year (22 goals, 36 assists) and again his junior year (45 goals, 29 assists) and is the top returning scorer back from last year. His ability to finish in close makes life tough for opponents but he’s also able to find teammates when the defense focuses on him. Andrew Sajdak and Sam Mattson will also be key pieces on the attack and the three showed good chemistry in their first game this year. Wes Bishop, who is committed to play at UMass Boston, is a great leader that will anchor the defensive unit. He has a lot of varsity experience and is the type of player that leads by example. Luke D’Amico is another experienced defender that will stand out for KP this year. Tyler Bartlett, Aiden Bender, Chris Longobardi, and Garrett Maxwell give coach Hal Bean a large group of experienced players. Junior Andrew McKinney is back in goal after splitting time in the cage last season. 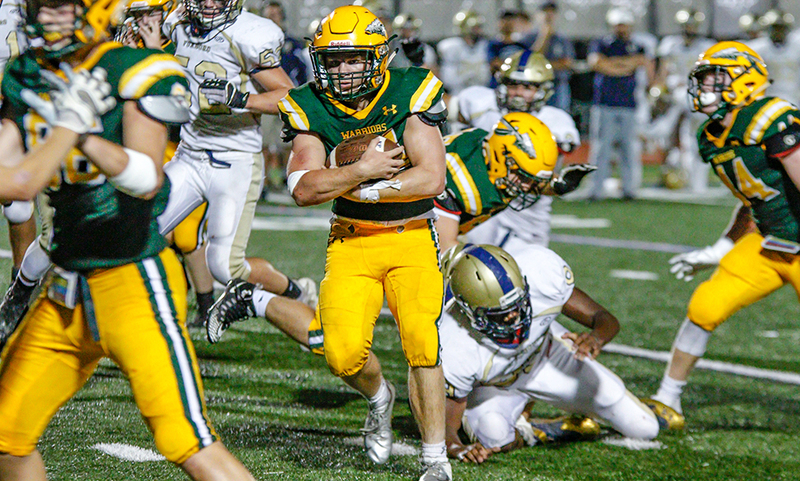 Mansfield has made the state tournament in each of the last four seasons and will be looking to make it five straight in 2019. It all starts in the midfield with senior Aidan Sacco. Sacco, who played quarterback this past fall for the Hornet football team, is like the quarterback for the Hornet boys lacrosse team. A lot of the offense will run through Sacco because of his vision and ability to share the ball. He is also a key part of the Hornet defense. His ability to get back and track opponents while also causing turnovers and transitioning defense into offense will be key for Mansfield. On offense, the Hornets have an experienced stick in the hands of Mike Reed, who will be relied on to lead the Hornets into the playoffs down the stretch. Connor Quirk will also be a key cog for Mansfield this year while Joe Plath, Sean Weber, and Will Nelson are going to be important pieces in the defensive unit. The Hornets have a strong piece in Nico Holmes at the face-off X. Holmes picked up varsity experience at the position last year and he will look to give Mansfield extra possessions this year in their push for the state tournament. Coleman O’Brien and Brian Rockwell are battling for the starting spot in the cage. After increasing their win total from 2017 to 2018, the Scarlet Hawks will be looking to continue that trend in 2019. With returning starters back in a lot of positions, second-year head coach Jacob Scordato is hopeful that Milford can make a run at a state tournament berth. The Scarlet Hawks bring back their leading scorer in Brendan White, who had 45 points last season (31 goals, 14 assists). White is a strong, physical forward with a strong shot. His ability to finish through contact makes him one of the top attackmen in the league. In the midfield, junior captain Danny Farrell is back after a standout sophomore year. Farrell, an LSM, led the team last season with 64 ground balls. Senior Ryan Pearl will anchor a defensive unit that is looking to improve on last season. Sophomore Evan Hazard had a standout freshman campaign between the pipes last year. He will be relied upon this season to help keep Milford in games as they make a push for the postseason. After coming close to the Davenport title a year ago, the Rocketeers are ready to make another run at the division title and as well as a deep playoff run. While the Rocketeers graduated some top talent in the league such as midfielders Jason McNeany and Max Fontes, defenseman Tommy Lockavitch, and attack Tommy Lindstrom, North Attleboro has talent and experience in every position. Juniors Nate D’Amico and Jake McNeany are back after splitting time last season and will be competing for minutes again this season. Defensively, the Rocketeers bring back three starters from a unit that allowed a league-low 95 goals last year. Junior Brett Labonte had a terrific season and will be joined by classmate Will Yeomans and sophomore Tyler Sarro. Head coach Kevin Young said the trio is tough, vocal, active, and play very well together. In the midfield, senior captains Nick Ward and Ryan Boyle will be key pieces. Ward will also see time at attack while Boyle will be a defensive minded midfielder. Junior Dan Conroy takes over as the main faceoff guy and will be joined by Ryan Rajotte, Damien Curtis, Nick Morse, Jack Puccio, Cam Cornetta, and Joe Milosh in the midfield. The attack will be spearheaded by junior Andy DeMattio, last year’s HockomockSports.com Underclassman of the Year. DeMattio had a tremendous season, scoring 52 goals and adding 22 assists for a team-high 74 points. “He should be fun to watch as he’s picked up some size and speed,” Young said. DeMattio will be joined by junior Jack Connolly and freshman Matt Antonetti. Coming off the best season in program history, Oliver Ames is aiming to have another successful year and hoping to replicate last year’s playoff push. The Tigers reached the D2 South Sectional Semifinals last season and bring back five of the top seven scorers from a year ago. While the top two scorers — Eric LeBlanc and Owen Gallagher — and their 146 points graduated, there is a lot of optimism in the program because they have reloaded for this year. Oliver Ames will be young on the attack with junior Sandro Masciarelli and sophomore Remi Creighton, but there is still experience in the position. Masciarelli had 25 goals last year while Creighton will see more minutes this year. The strength of the program will be in the midfield with the likes of senior captain Colin Bourne (30 goals), junior Shane Kilkelly (32 goals), junior Sam Stevens (23 goals), and junior Frankie Ireland (29 goals). That group was a big reason for OA’s memorable season last year and now have a year of experience playing together under their belts. Defensively the Tigers are looking for senior captains Shane Murphy and Matt Saba to lead the way. Both players were apart of the defensive unit last year and have been a big reason for the program’s improvement over the past couple of seasons. Senior LSM Cullen Gallagher will be a key defensive midfielder while junior Tyler Campbell will likely factor into the Tiger defense this year. Junior Nick Gillis returns as the starting goalie while senior Steve Heino is an experienced backup. Sharon has a strong mix of returners and new faces and is hoping that combination will result in a return trip to the state tournament. The Eagles will have an experienced defensive group with all three starting defensemen back this year, and all three are seniors. Sam Spencer, Coleman Loftus, and Ronin McCabe are back to give the Eagles a formidable defensive group. Having an experienced defensive in front of new goalie, sophomore Adam Rabb, will help as the season gets underway. Sophomore Drew Litner is back after a terrific freshman year. Litner can score but he is one of the most unselfish players in the league and does a terrific job finding teammates on the move. He was among the league leaders in assists last year, dishing out 28 helpers. Litner will be joined by senior Brandon Buckman and freshman Zack Waxman in the attacking group. The midfield will also have a good amount of experience with seniors Daniel Lillenfeld and Mitchell Director leading the way. Nick Stamm and Rowan Barnes have impressed this preseason and should be apart of the group as well. Junior Max Posner could be poised for a breakout year while sophomore Cobe Jacobson and freshmen Brady Daylor and Jace Nestler will be in the mix too. Returning LSM Tyler Freedman is back after a terrific rookie campaign and could be a top player for the Eagles while there are high hopes for freshman faceoff specialist Ben Shocket, who could be an X-factor for the Eagles. The Black Knights enter their third season as a varsity program and are looking to continue to grow as a program in a difficult league. After being inexperienced last year, the Black Knights are hoping the lessons learned from last year will pay off this year. It starts with the four captains: Sean Doherty, Luke Bainton, Alex Wilson, and Nate Wilson. Doherty and Bainton will do a little bit of everything for the Black Knights and will be two of the top options offensively. Alex Wilson and Nate Wilson will anchor the defensive unit, bringing plenty of lacrosse experience to that group. Stoughton is also looking for a big season out of junior Foster McLeod. McLeod has shown in the past the ability to beat defenders and create opportunities for others. Sophomores Max Huminik and Mike McLaughlin will also see increased roles after impressing during their rookie seasons in 2018. Sophomore Thomas Ratcliffe, a Hockomock League honorable mention last year, returns in the cage and gives the Black Knights a steady presence between the pipes. Sophomore Marty Barrett returns as a long pole and will be a key piece of the Knights’ defense. FOXBORO, Mass. 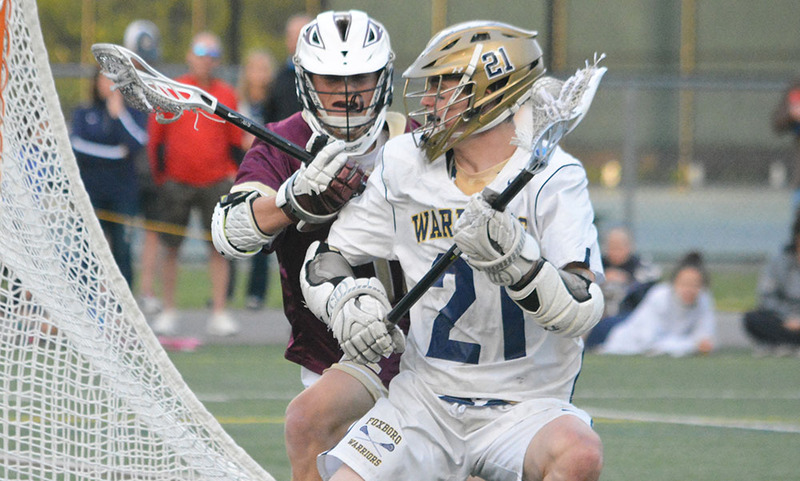 – When the Foxboro boys lacrosse team made its season debut on Monday, the Warriors let a lead, and a win, slip away against Medway. The Warriors studied their mistakes with a long film session on Tuesday, ready to right those wrongs in their Hockomock League opener against North Attleboro on Wednesday afternoon. The study session paid off as Foxboro raced out to a 4-0 lead, killed three third-quarter penalties, and pulled away with a strong fourth quarter to pick up a convincing 9-2 win over the Rocketeers. “We needed that bad, a bounce-back win,” said Foxboro head coach Matt Noone. “We had some big mental mistakes [on Monday] like sliding up field, not trusting the offense that we run. The film was better than anything we could have done on the field yesterday…Every day we’re going to get better. The Warriors wasted little time to get things going. Just under two minutes into the game, junior Aidan Stapleton connected with classmate Shayne Kerrigan in front for a close finish and a 1-0 lead. Just two minutes later, Foxboro converted its second shot on net, this time off the stick of Pete Conley, who ripped a shot from distance up high. North Attleboro struggled to keep possession when it did get into the offensive zone as the Warrior defense of Pat Stapleton, Ronnie MacLellan, and Will Morrison played strong man-to-man defense and didn’t allow any open cuts in front of the net. Foxboro struck for quick back-to-back goals again inside a minute span late in the first quarter. Conley grabbed his first assist when he found sophomore Charlie Baughan right in front for an easy finish. The Warriors made it 4-0 just 27 seconds later, fresh off a face-off win by Kerrigan (10 face-off wins). Senior Brendan Tully beat his defenseman and found some space before firing a shot into the back of the net. The Rocketeers did improve in the second quarter, winning an early face-off and getting on the scoreboard. Senior Damien Curtis went one-on-one and was able to find some space to fire a shot into the back of the net. North Attleboro had a chance to add to its lead with a man-up opportunity with four minutes left in the half but couldn’t convert. Foxboro then went on a man-up chance and Baughan took a feed from Conley and scored to make it 5-1 heading into halftime. Foxboro’s defense killed another Rocketeer man-up chance midway through the third quarter but North Attleboro cut into the deficit just over a minute later when junior Ryan Rajotte ripped a shot inside the near post. With a minute left in the third, Big Red had a two-man advantage for 30 seconds and a one-man up chance for the final 30 seconds but North Attleboro’s offense was only able to muster one shot and Foxboro freshman goalie Matt Tully (seven saves) made the stop. On the other side, Foxboro cashed in on an extra man chance early in the fourth quarter. Just seconds before the call was set to expire, Tully found Kerrigan for a shot from the right side that found its way to the back of the net. Four minutes later, Tully really put the game out of reach with a strong individual effort. He backed his way down against a defender, and then went to his right as the double came and unleashed a hard shot that the goalie had no chance at stopping. Aidan Stapleton (from Conley and Kerrigan) and freshman Jack Avery (from Kevin Tully) scored in the final minutes to give the Warriors the 9-2 win. North Attleboro (0-1, 0-1) is back on the road on Friday against Wayland. Franklin senior Jacob Alexander hasn’t led the league in any offensive category before but he might be the most dominant player returning this season. Alexander has been the best faceoff man (83.6% career win percentage) in the Hockomock League over the past three years, and was one of the best in the entire state last year. His ability to give Franklin extra possessions gives the Panthers an incredible advantage. If they have the lead, they can quickly add onto it. If they are trailing, its likely Alexander can get them the ball right back and start a comeback. Over the last two seasons, we’ve seen Alexander really expand his game and get more involved with the offense beyond just the faceoff, scoring five goals and adding 15 assists last year. He was named first-team All American in 2018. North Attleboro junior Andy DeMattio made a huge splash last season, emerging as one of the most dangerous attackmen in the Hockomock League. He paced a potent Rocketeers offense with 52 goals and 22 assists, a team-high 74 points. He was named HockomockSports.com Underclassman of the Year and to the HockomockSports.com Second Team for his strong sophomore year. With North’s point-leader Tommy Lindstrom graduated, DeMattio is going to likely be the focal point of North’s offense. The junior has the ability to move the ball and find teammates in good positions but he also has the size, speed, and strength to go at defenses one-on-one. Expect DeMattio to have another successful season this year. King Philip senior Colin DeVellis has tormented defenses for the past two seasons and will be looking to cap his Warrior career off in style. Although not the biggest player on the field, DeVellis is one of the quickest players and finds ways to get past defenses and is very strong finishing in close. Last year, he scored 45 goals in the regular season, tied for fourth most in the Hockomock League and added 28 assists, ranking fourth in the league with 73 points. Whether he has the ball or no, DeVellis can be a nightmare for opposing defenses trying to keep track of him. His pace allows him to get open and he is certainly one of the best finishers in the league. Oliver Ames had its best season in program history in 2018, going 14-7 and reaching the D2 South Sectional Semifinals. One of the reasons for that was the strong play of then-sophomore Shane Kilkelly. The Tigers had a lot of weapons, including the program’s all-time leading scorer Eric LeBlanc and Owen Gallagher, both of whom graduated. Kilkelly stepped in to give OA a three-headed monster on the offensive end and now will be relied upon as one of the go-to options for the Tigers. One of the junior’s strongest attributes is his distribution. Not only did he have 25 goals last year, he had a team-high 33 assists, which ranked fourth in the Hock and most among returning players. In fact, Kilkelly is just one of three returners with over 25 assists last year. Kilkelly is also a strong two-way player and a main component of the Tigers’ transition game. The Hockomock League has been loaded with some top goalies over the last couple of seasons. North Attleboro’s Dan MacDonald won the league MVP in 2017 and Foxboro’s Jake Addeche earned the honors last season. Attleboro’s Trevor Koppy has certainly earned his way into that conversation with his play over the past couple of seasons. Now a senior, Koppy could be in line for his best season yet. His goals against average can be a bit deceiving but his save percentage (64.1%) was right up there with the league’s best. He also boasted a league-high 309 saves last year, helping the Bombardiers stay in games at times. He does a nice job reading the play and has quick reactions. He has a tremendous clear that can help the Bombardiers turn defense into offense. There aren’t too many players in the league this year that are as experienced as Franklin senior Patrick Morrison. Morrison, who is committed to play lacrosse at Boston University, has been a big part of the Panthers’ lineup since he was a freshman. Now a senior, this season could be Morrison’s best. His size (6’3) gives him an advantage on opposing attackmen, and over the past couple of seasons, his speed and strength have both increased allowing him to be a lockdown defenseman. He has no problem playing physical but his ability to read and anticipate plays along with strong stick work often results in cause turnovers. He will certainly be a key part of the Panthers turning defense into offense. Canton has a good amount of pieces back from the team that reached the D2 South Sectional Semifinals last season, including one of their leading scorers in Griffin Roach. Roach scored a team-high 28 goals last season, had 13 assists, and finished with 41 points in the regular season, which was second most on the Bulldogs. Roach is a confident player that has no problem taking the big shot when needed. If the Bulldogs are in a close game or a situation where they need a big goal, Roach is the type of player you want with the ball on his stick. He has great speed and is very strong in possession. He will be one of the toughest one-on-one covers in the league this year because of his ability to find just enough space to finish. And as we’ve seen over the past two years, his ability to score has improved each season. Mansfield made it to the D1 South tournament last season but suffered an early exit. The Hornets are aiming to return to the playoffs again this year and one big piece will be senior midfielder Aidan Sacco. Sacco does it all for Mansfield, playing a big part in the defense while also being a catalyst on offense. He’s a very confident player that will likely be a key piece in transition the Hornets from defense to offense. He has a lot of lacrosse experience and is one of the smartest players in the league. The Hornets are going to rely on his decision making and ability to find open teammates throughout the 2019 season. Foxboro has been one of the best defensive teams over the past couple of seasons and one constant in that unit is senior Pat Stapleton. A key player on the Warriors since his freshman year, Stapleton will be the anchor of the defensive unit this year. He is committed to play at Connecticut College and will be looking to lead the Warriors to a deep run in the state tournament this year. The combination of size and speed makes him one of the top defenseman in the league. Stapleton always seems to be in the right position when Foxboro needs a big stop. Not only is he a top player, he is one of the best leaders in the league. Foxboro should have one of the top defensive groups with Stapleton leading the way. The Davenport division has run through Foxboro in two of the past three seasons, and senior Brendan Tully will be looking to make it two straight and three of the last four. Tully has had a lot of success in his career at Foxboro but his best might be saved for his last year. Warriors head coach Matt Noone described Tully as the best player on the Warriors as well as the hardest worker, which isn’t always the case. Committed to Providence College, Tully is a blue collar type player that works hard from the opening whistle to the final buzzer. Not only is he an important part of the Warriors’ defense, he is a tremendous offensive player. He scored 44 goals last year and added 20 assists. His lacrosse IQ is off the charts. Below are the official 2018 Hockomock League Boys Lacrosse All Stars, selected by the coaches in the league. FOXBORO, Mass. 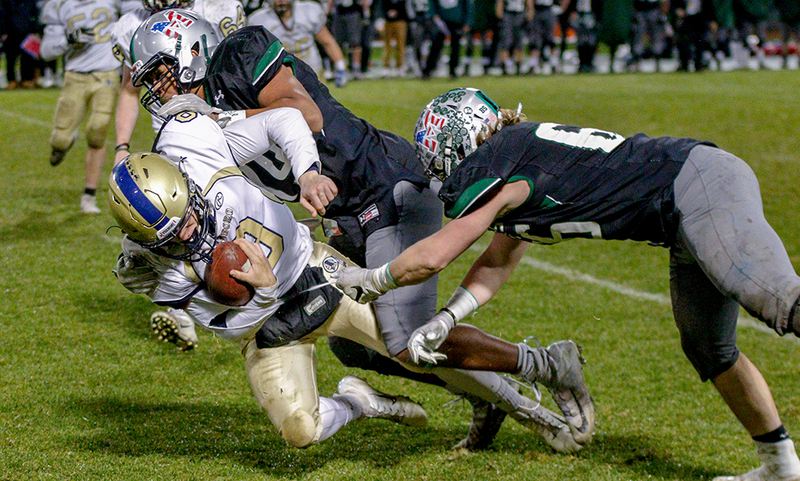 – It’s safe to say Foxboro learned its lesson from last year’s game against Franklin. The Warriors trailed 5-0 after a quarter in last year’s contest before ultimately falling 9-5. This time around, they made sure to get off to a better start. Foxboro dominated opening frame this year, building a 4-0 lead before having to hold off a Franklin comeback, eventually pulling out a 7-6 win in double overtime to beat the Panthers. It’s the first Hockomock League loss for the Panthers since April 2014 (11-10 in overtime to King Philip), snapping a 49-game league win streak. With the win, Foxboro clinched the 2018 Hockomock League Davenport division title, the program’s second in the last three years. “We try to start fast and we don’t always get it but we did today,” said Foxboro head coach Matt Noone. “Last year we got off the bus and we were down. I told them we can’t lose the game right away. We knew we could play with them, they believed in the system and it showed. It was just a great game. 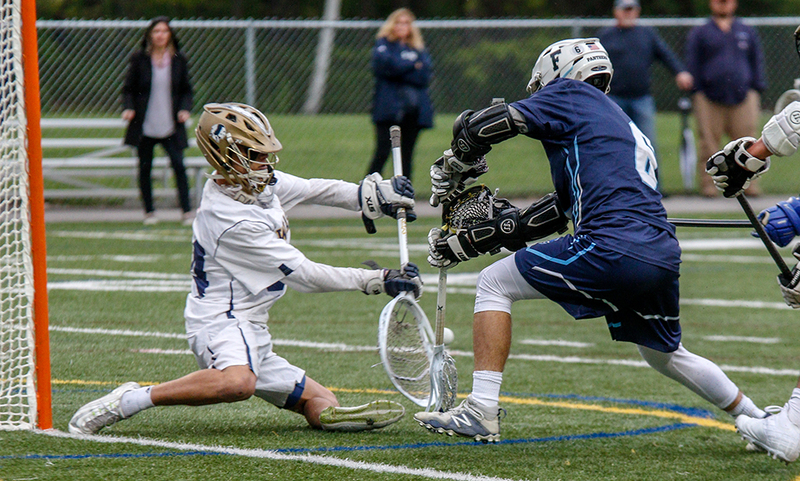 Foxboro had the best chances in the first overtime despite Franklin junior Jacob Alexander winning the OT face off. Pressure from Kaveny forced an errant pass by the Panthers but the Warriors couldn’t solve Franklin goalie Connor O’Rourke. O’Rourke made three of his 14 saves in the first overtime period to keep it level. Franklin had a second chance to get its offense going but lost the ball in transition. Both sides had chances in the second overtime, both sending shots just wide. Addeche came up with his 14th save of the game, denying a wrap around low shot from Civetti, putting the Warriors on offense. Senior Louis Piccolo was originally denied as he tried going to his right a couple of times but came back and whipped a quick sidearm shot that snuck in at the near post to give the Warriors the win. “Special players make special plays and step up in the big moment.” Noone said. “That play Louis made, I was calling for him to make a pass and he stuck it like that, that was magical. We had a bunch of guys step up, [Brendan] Tully, Shayne [Kerrigan], my sophomores played great, Jake [Addeche] was awesome in goal…it was just a great night for Foxboro lacrosse. Foxboro’s Brendan Tully opened the scoring just before the midway point of the first quarter, taking a feed from Andrew Whalen and depositing it into the back of the net. Just a minute later, Pete Conley ripped a rising shot to give the Warriors a 2-0 lead. Just 15 seconds into an extra-man opportunity, the Warriors made it 3-0 when Piccolo picked out the top corner. And on the ensuing face-off, Shayne Kerrigan was able to corral a loose ball and raced all the way down before finding the back of the net with just a minute left in the opening quarter. “We just spotted them those four early goals and it was tough to battle back,” said Franklin head coach Lou Verrochi. “We held them scoreless for over a half after their sixth goal. Credit to the kids, they battled back and were resilient, but what can you say, Foxboro is a good team. 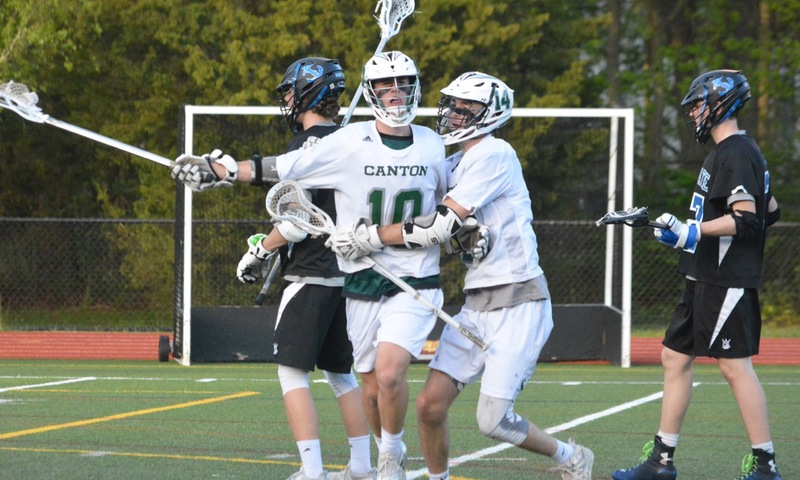 Franklin got on the board three minutes into the second quarter when Civetti found Nitin Chaudhury cutting to the goal and the junior made no mistake and buried it into the back of the net. But that would be the Panthers’ only goal of the half. Foxboro extended its lead back to four with under a minute left in the second quarter as Mike Moses took a handoff from Kerrigan before whipping a shot on target for a 5-1 lead. The Warriors’ offense continued to roll to begin the second half when Piccolo made it 6-1 less than three minutes into the frame, but Foxboro wouldn’t score again in regulation after that. Franklin scored back-to-back goals just 16 seconds apart at the halfway point of the third quarter. First, Addeche was caught out of goal after a turnover, leading to an empty net goal from Civetti. Alexander won the faceoff, raced up, the ball bounced loose in front and Civetti pounced and scooped it into the back of the net to make it 6-3. While the score stayed that way for the rest of the third, it took just seven seconds for Franklin to cut the deficit when the fourth quarter started. After another win from Alexander, he found Jake Davis who wasted no time in finding the back of the net with a hard shot. The Warriors had a two-man up opportunity halfway through the final frame but couldn’t add onto its lead. Franklin had a man-up chance shortly after, and although they didn’t score during it, Chase Tanner used a wicked shot shortly after snuck under the crossbar to make it 6-5 with 4:46 to go. Franklin tied the game 90 seconds later. Chaudhury made a nice move to gain some space and then found Civetti in front and the senior faked a low shot before dumping it in up high to tie the game. Foxboro had a man-up chance following the goal but O’Rourke came up with a big stop at the tail end of it, giving Franklin possession with two minutes to go. The Panthers nearly had the game-winner with 1:25 left but hit the post. Foxboro boys lacrosse (9-1, 14-1) Hockomock) is back in action on Monday when it travels to Xaverian. Franklin (10-1, 12-3) is back in action on Friday night when it hosts Cohasset.